As noted in the memorandum, Attorney General Becerra’s decision rests in significant part on the ongoing litigation filed by this office in Los Angeles, San Bernardino, Orange, Ventura, Contra Costa, and Santa Barbara counties, with specific reference to two temporary restraining orders issued by the courts in Los Angeles Police Protective League v. City of Los Angeles (Super. Ct. Los Angeles County, 2018, No. 18-STCP-03495), and Richmond Police Officers’ Association v. City of Richmond (Super. Ct. Contra Costa County, 2019, No. 19-0169.) This office has obtained restraining orders in all pending cases in all counties. We hope and expect that law enforcement agencies throughout the State of California will follow the lead of Attorney General Becerra and not apply SB 1421 retroactively, by refraining from releasing personnel records that pre-date January 1, 2019. 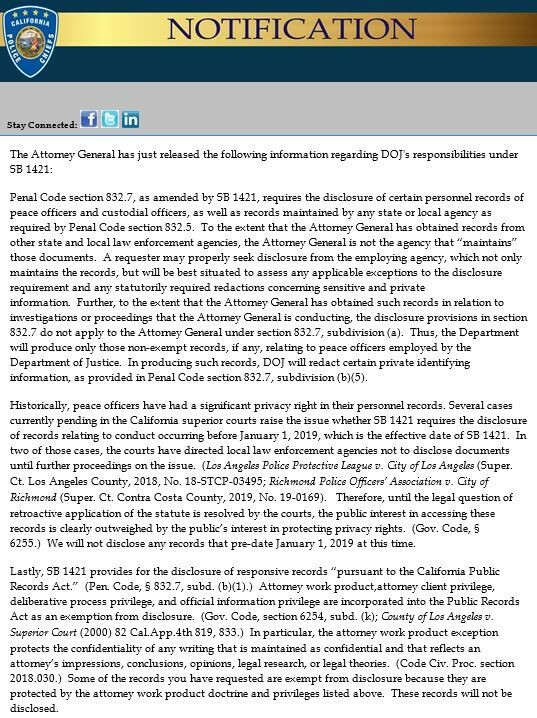 Such a decision is consistent with peace officers’ right to maintain the confidentiality of their personnel file information prior to the operative date of SB 1421 and the Legislative intent of the new law.